Not much seems to be known about Elis Behmer. But his one and only book "Das zweischneidige Schwert der Völkerwanderungszeit" (The double-edged sword of the migration period) is still the standard for our topic here. It was published in 1939, a time when "Germanic" stuff was prominent in Germany (and Scandinavia); the book should be read with this in mind. Behmer's book is apparently his PhD thesis work1) and contains a huge amount of hard information in the form of (black-and-white) pictures of a large number of objects plus detailed information about their origin and whereabouts. Behmer established three main groups (A, B and C) for migration period swords, with 4, 3 and 2 subgroups, respectively. In contrast to the classification given here, Behmer does not consider the blades but looks at everything else, in particular the hilt (with pommel, grip, cross guard) and the various metal parts associated with a scabbard (chape, locket, belt attachments etc.). His classification of the sword from the earlier periods (say 350 AD - 450 AD) is based to a large extent on the Danish bog finds and thus overlaps with the modern systems. However, for the time after 450 AD, his system is still the one everybody seems to use. 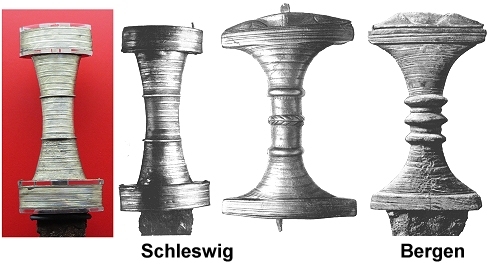 Behmer sees swords with this kind of hilts (and proper other parts) as the oldest "Germanic" types. They are typical for finds in Danish bogs. The one the left is indeed from Nydam and on display in the Schleswig museum. 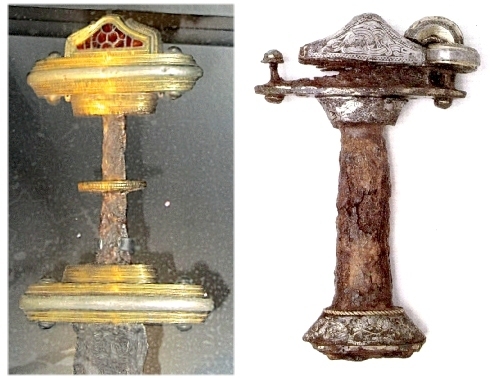 There are also finds from graves, and according to Behmer this kind of sword was prevalent all over Northern Europe (including England) around 300 AD - 400 AD. 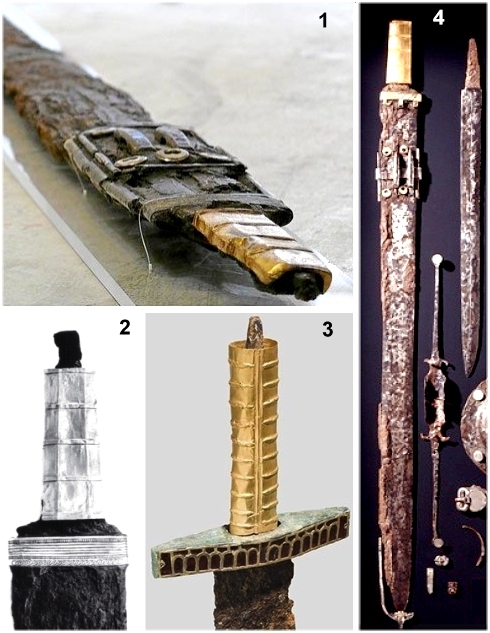 Since we know that a least the blades found in Danish bogs were all of Roman make, this would indicate that the Germanic tribes used (pattern welded) Roman blades but attached their own hilts. This is quite possible; there are indications from all eras that one and the same blade may have seen different hilts. It is, however, hard to prove. Behmer, like many archaeologists, is reluctant to make definite statements. All the numbers given are therefore mostly my interpretation of what he conceals in lengthy prose. Typical group A, subgroup 2 hilts. On the right a new photography of the real thing. Typical group A, subgroup 3 hilts. The blade is broad and bears no resemblance anymore to Roman types (says Behmer). The blades tend to have one (broad) fuller but "rich damascening is only found on exceptions". I'm not sure if that is true since many of these blades are badly corroded and "damascening" is not obvious and only shows up in X-rays (that Behmer didn't have). 1 Spatha from Gültlingen; 460 AD - 480 AD. Only the showy side of the hilt is gold; the gold is "Rhinegold". Landesmuseum Stuttgart. 2 Spatha from Sindelfingen; rather similar to 1. Table 8 in Dorothee's thesis. 3 Spatha from am 2006 auction (Hermann Historica). Supposedly from 375 AD - 450 AD and Eastern Europe. Estimated at  30.000 - 45.000. 4 Recently found spatha (plus sax etc.) from Pleidelsheim; ca. 400±. Rather similar to 1 again. The group A3 swords are the swords of the Alemmani (or Alamanni). These swords spread from their homeland in South Germany to the West, East and North, states Behmer. Well, maybe, but not in the way Behmer describes it. In his reasoning the "Heruli" play a major role, an East Germanic tribe who migrated from Scandinavia to the Black Sea in the third century AD. The Heruli, however, according to more modern insights, were not as important as earlier historians believed. "Goldgriffspathen" (gold grip spathae) appear around 450 AD  490 AD and are nowadays seen (by some) as derivatives of a Romano-Byzantine design. The culmination of this kind of sword was found in the grave of Childeric I, who died on 481 / 2 AD. We also have an early lavish use of red almandine gemstones for decoration. Childeric I (ca. 440  481/482) was a king of the Salian Franks, those Franks in the North-East (present day Belgium, North France). He fathered Clovis I, who would unite the Franks and founded the Merovingian dynasty that eventually subdued and wiped out the Alemannis. His sword, however, was evidently imported from the Alemanni. Since it must have been made some time before his death we can date it to 450±. His tomb, around Tournai, Belgium, was discovered in 1653. The many precious objects it contained were kept in a library in Paris. In 1831 they were stolen and melted down. Only a few pieces survived including the pieces shown above. From the#rest we have only drawings. I'll skip the peculiar but not so interesting group A, subgroup 4 swords (Eastern type) and continue with group B, subgroup 5. You know these hilts from Nydam and especially Esbjol. Typical group B, subgroup 5 hilts. Source: Photography from Schleswig-Holstein Landesmuseum, otherwise Behmer's book. Those hilts are almost exclusively form Danish bogs; they date to the end of the 4th century (380+) up to about 500 AD. Behmer includes some rather different looking hilts from Norway in the same group; see below. I'm not sure about that. Source: Some Polish sword site; can't give details, sorry. I'll skip the subgroups 7 - 9. They are more or less a transition from the "fancy hilt" group 6 to the "Viking sword" that has its own backbone chapter. For the remainder of this module we look into the fascinating if somewhat decadent subgroup 6. These pommels are typically made from precious metals, often inlaid with (then very precious) almandine (a garnet variety, mostly red but other colors do also exist). They are flimsy and neither well suited for fixing rivets nor for bashing heads in. They are prominent in Wilfried Menghin book "Das Schwert im frühen Mittelalter" (Swords during the Early Middle Age) from 1982. 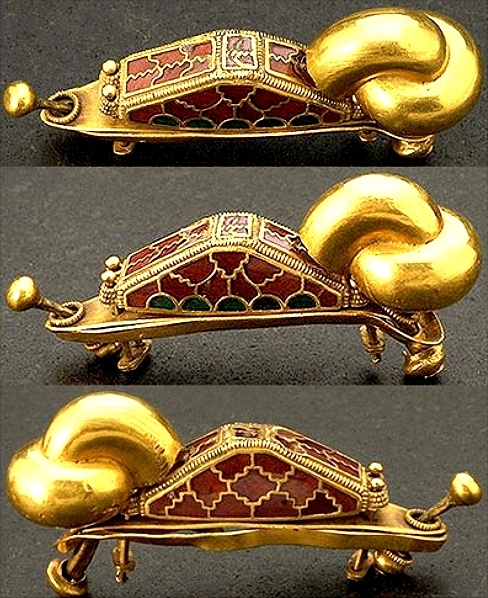 We have a peculiar pommel shape, more or less reminiscent of a pyramid or actually more of a bicorn hat or cocked hat (the kind Napoleon and Lord Nelson liked to wear). Pyramid pommels also come with a ring attached to one side as shown above. In Behmer's systematic they belong to the large group B, subgroup 5. 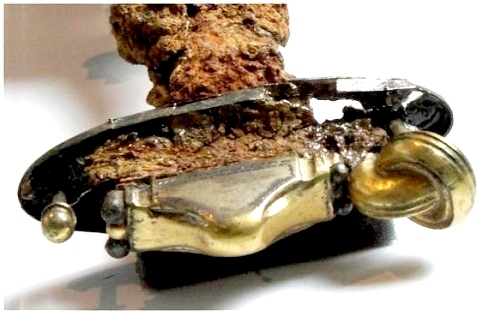 In less well preserved specimen we see a lot of rivets, one rivet is quite prominent in the right-hand side hilt above. It serves as a solid endpiece on which the end of the tang can be securely fastened by riveting, i.e. by hammering it flat. Riveting the tang in this way fixes all the pieces forming the hilt - at the minimum cross-guard, grip and pommel - securely to the blade. It provides the necessary weight needed to balance the sword. 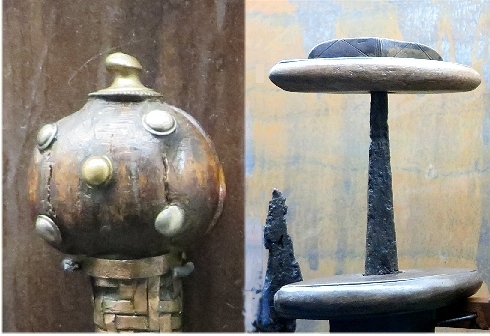 It serves as decorative element, signaling the wealth / importance of the sword owner. It bears insignia (e.g. a cross) that signals membership to certain groups (e.g. a "T" for Templer). It supplies a bit of magic, e.g. by enclosing relics, being engraved with symbols or runes, or by other means. Suffice it to mention "sword pearls" in this context. It keeps the hand from slipping. That is quite important if you thrust down, e.g. from horseback. Hilts belonging to Behmer's subgroups 1, 2 and 5 essentially incorporate points 1 and 6 of the list above, with a bit of point 3. Points 2, 4 and 5 are absent. As far as decorative functions are concerned, the pommel is not much different from the rest. Eastern swords (Behmer's subgroup 4) are not contained in this system. Their tang is short and does not extend all the way to the pommel. Only the grip is fixed to the tang (I'm not sure how) and the pommel is kind of "nailed" to the wood forming the grip. Subgroup 5 is different. Points 1 and 2 are pretty much missing but points 3 - 6 are very pronounced. Of course, the tang is still riveted to a part of the many pieces forming the pommel now but that is done in an invisible way "inside" the whole construction. Let's look at few pictures to illustrate this. The two on the lower right-hand side are special: they have a pyramidal shape and belong to early "subgroup 6" swords. 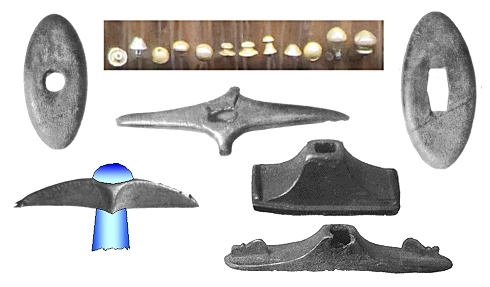 As long as you use these pommel endpieces for riveting the tang by banging it (cold) into a mushroom shape, these pieces needed to be made from solid steel and thus could not be particularly decorative. Source: from Olga Stroganova's on "Pin It"
You either used gold inlaid with almandine or at least silver or bronze parts, more or less fancily decorated . 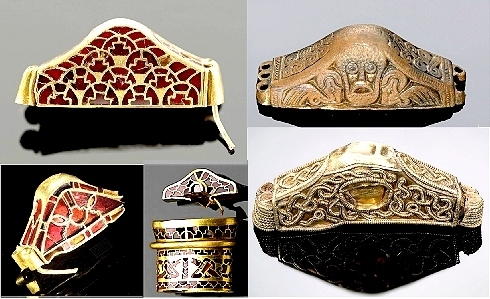 "Fancy pommel" science got a mighty kick in 2009 when the so-called "Staffordshire hoard" was discovered in England. It consists of about 3,500 precious items that are mostly related to weapon decoration (nothing for females in there). Most everything dates to 600 AD - 700 AD; a few early pieces go back to about 530 AD, the youngest ones are from 700+. The items must have been intentionally damaged, if only by prying them off by force from a hilt. And as useless, now, to mankind as ever. So we had looting and burial of treasure. The latter, however, in connection with the burial of a hero and not "just so". 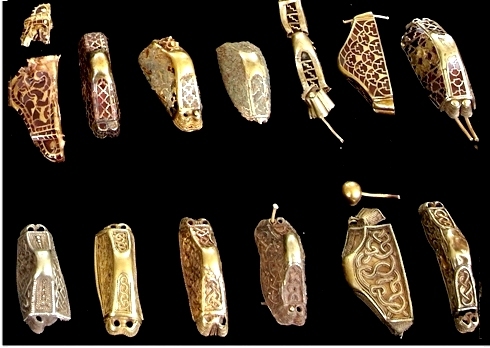 Among the items were 86 "pyramid" pommels; 64 made from gold; the rest silver (17) and bronze (5). 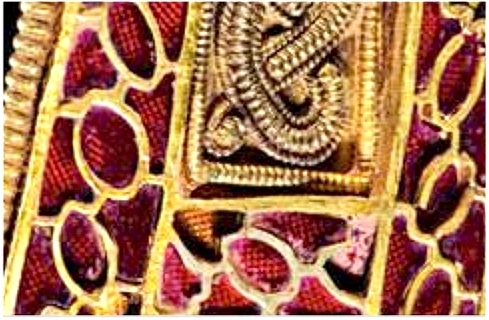 17 of the gold pommels were inlaid with garnets in the cloisonné technique (look it up yourself), the rest were heavily ornamented. But only one sported a ring! (see below). Compare that to the 29 pommels collected from a huge area around Uppåkra, Sweden, and the 5 pommels from the Snösbäck / Sveden ritual deposit. There are many single stray finds, of course, and we have about 400 pyramid pommels altogether. But with 86 pommels from one place (plus all the other objects) there is now plenty of material to study in a known context. There is more to these expensive masterpieces of early medieval gold-smithing than meets the eye. The surface of the gold below the garnet is often textured into a regular pattern of little pyramids that reflect the light back - just like the reflectors of your bicycle. This can be seen in the picture below or in the lower left pommel of the picture here. That's what the source given had to say about this pommel. 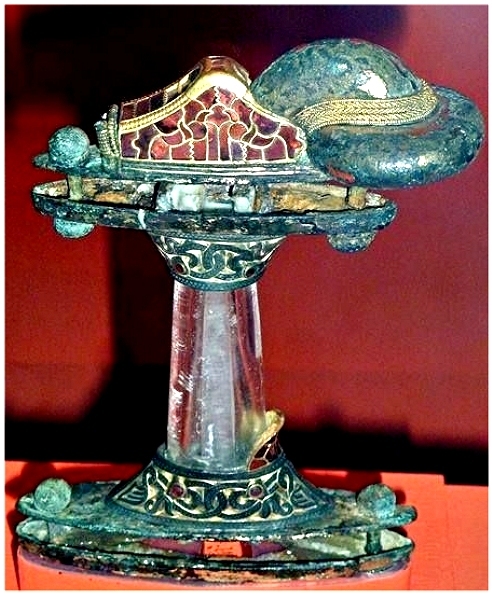 The actual pommel, however, is on display in the Stockholm archaeological museum. Boars are associated with the prominent Norse God Freyr who gets around by riding the shining dwarf-made boar Gullinbursti. 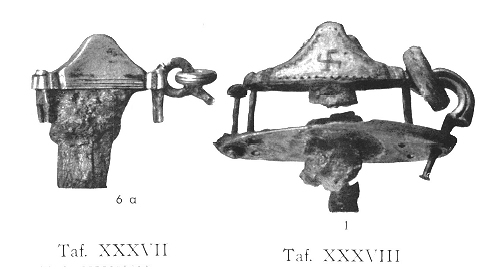 Depictions of boars heads on the pommel might have given protection by magic. Here is another pommel with garnets on one side and a kind of Celtic braid in gold on the other side. Fancy pyramid pommels thus appeared around 550 AD - just about the time when the Merovigian and Vendel periods started. That is why these fancy hilts are often associated with these cultures. Now you are prepared to appreciate the "pommel ring puzzle ". Some of these hilts come with a ring attached to one side; see above. The puzzle is simple: Why? The answer is simple, too: We don't really know! We have some idea how this "pommel ring" developed. Some people call it "ring pommel" but that will lead to a mix-up with the those swords where the whole pommel is a ring. In the beginning, it seems, somebody just used one of the rivets to make a little loop, enclosing a freely moveable ring. Also note the magical sign on one pommel. Source: From Olga Stroganova's web site on "Pin It"
This example gives us a weak clue to what rings were good for. The massive ring on this hilt was added some time after the hilt had been made. Pieces of the wonderful gold - almandine work had to be cut off and damaged to make place for the ring. There is evidence that this has happened with other hilts, too. 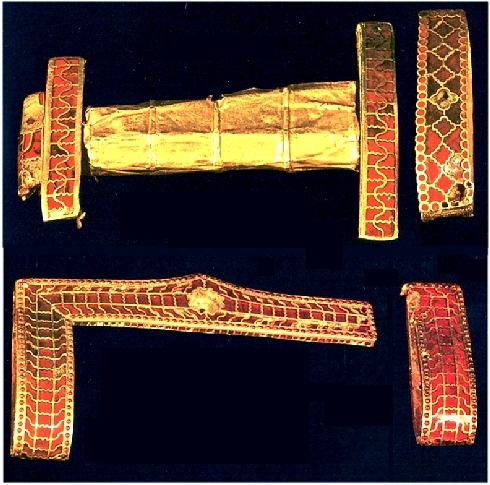 There is also evidence that a ring was sometimes also removed from a hilt. 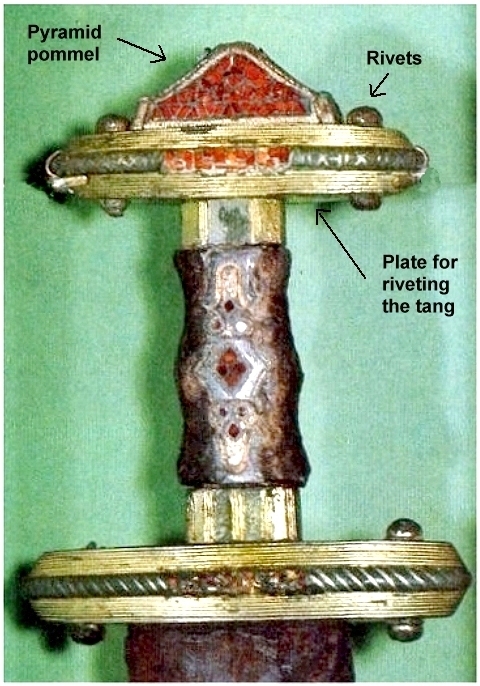 The ring held a strap used to tie the sword to the scabbard. This is obviously wrong considering that many "rings" weren't hollow anymore, see above. And the riveted loop or eyelet would have been sufficient for doing this anyway, no additional rings would have been needed. The ring assembly served as counterweight to balance the blade. That could have been done in simpler ways, not to mention that it wasn't efficient. The ring assembly just was an ornament. The opposite is true. The effect of the expensive and elaborate ornamentation already there was destroyed. The hilt above would look better without the ring. The ring supplied some magic. Well - maybe. But why was it then removed on occasion? And why did not every hilt sport a magic ring? If you had the means to acquire a gold - garnet assembly, you certainly could have procured a magic ring, too. 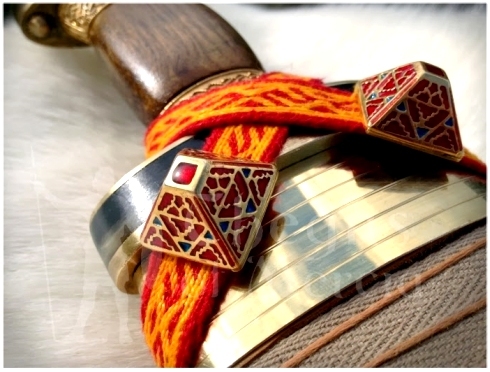 Securing a sword with a peace band as shown also explains in a rather natural way the function of all those "sword pyramids" or other adornments that have been discovered in a number of Anglo-Saxon graves, lying beside sword scabbards. From the way they are constructed they were obviously meant to be attached to a strap of some kind. The rings advertises membership to some formal or informal warrior club, like the "club of Nobel prize winners" or the "club of warriors who saved the live of their boss" or the club of the "bearers of the Golden Honor Needle of the Kiel University" (guess who belongs to that club). The ring assembly then was awarded by some leader to a special person. It was just like receiving a medal today. The rings are "oath rings" symbolizing the linking of persons, just like wedding or engagement rings. You put "the ring" on your pommel after you swore eternal allegiance to your leader. You removed it after you stabbed him in the back. That seems to be the best explanation to me. Enough. We simply don't know the exact function of the pommels with rings for for sure. But more and more people (including researchers) employ themselves to solving the riddles of iron steel and swords and new insights are certain to be made in the near future. AKADEMISK AVHANDLING SOM MED TILLSTÅND AV HUMANISTISKA FAKULTETEN VID STOCKHOLMS HÖGSKOLA FÖR VINNANDE AV FILOSOFIE DOKTORSGRAD FRAMSTÄLLES TILL OFFENTLIG GRANSKNING I HÖGSKOLANS LÄROSAL D LÖRDAGEN DEN 9 DECEMBER 1939 KL. 10 F. M.
I'm rather sure that this means it is a PhD thesis.